Native to Central America, the poinsettia got its name from Joel Roberts Poinsett, the first US Ambassador to Mexico. In particular, the plant grew in the southern portion of Mexico known as Taxco del Alarcon. When Pointsett wasn’t working on international affairs he was dabbling in botany. He was able to bring a sample back his hometown in South Carolina after a trip to Mexico. He began growing the plant in his greenhouse and sent out grown ones to friends and botanical gardens. John Barroom, from Philadelphia, was one of the recipients of Poinsett’s plant. He then gave it to Robert Buist, a friend of his who loved plants. Buist is believed to be the first person who commercially sold pointsettias. While the plant didn’t initially catch on – Poinsett brought them back to the US in the 19th century – it became a Christmas staple around the 20th century. In fact, the plant has a special day dedicated to it – National Poinsettia Day – which is celebrated on 12 December which is also the day Pointsett passed away. But how did the poinsettia become associated with Christmas? Why Is the Poinsettia Plant a Christmas Favourite? According to a Mexican legend, there was this girl called Pepita who was sad that she couldn’t give the baby Jesus a present during the Christmas Eve service at church. Her cousin, Pedro, tried to cheer her up by saying that the infant would be happy receiving a gift – even just a small one – from someone who loves him. Pepita picked up a bunch of weeds from the roadside and organized them into a bouquet. Although embarrassed by her present, she remembered the words of her cousin Pedro and continued to walk through the chapel until she reached the altar. As she lay the bouquet of weeds at the bottom of the Nativity scene, they suddenly transformed into bright red flowers. Starting that day, the plant was referred to as Flores de Noche Buena or Flowers of the Holy Night. Another interpretation sees the plant as a symbol for the Star of Bethlehem. This is the start that the Three Magi used as a guide to get them to the birthplace of the baby Jesus. For some, the red leaves of the poinsettia plant represent the blood of Christ. Since only 80% of poinsettias are red, the white variety is said to symbolize the purity of Christ. Given that the pointsettia is native to a region that is mostly warm. Since they don’t like the cold, they can be bit difficult to care for during the winter, but keeping the conditions ideal indoors will see the plant through Christmas and well after New Year. Whether you’re looking for a pointsettia plant for yourself or to give to someone as a Christmas present, we have exactly what you need. 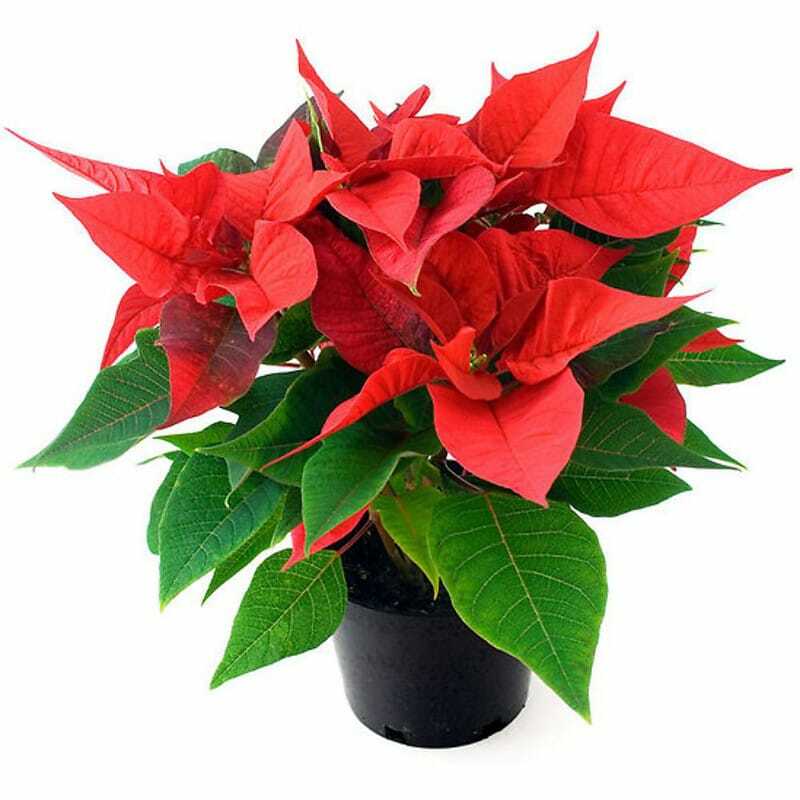 We here at Clare Florist have a Festive Red Poinsettia Plant that can be delivered to you ready to bloom. We can deliver the next day but make sure to get those orders in before Christmas!